The Citrix XML server is a component of Citrix XenApp and XenDesktop that’s used to enumerates available resources and provide secure tickets for users that to use the WebInterface or CloudGateway. In this article I’ll explain what the services the XML service provide, how it does it job and all you need to know about it. The Citrix XML service is a Windows service that is part of the Citrix XenApp and XenDesktop product. It is used to provide XML data requests sent by Citrix components. It is introduced with MetaFrame 1.8 SP2, since MetaFrame XP is is a standard feature. Up to XenApp 6.0 each XenApp server could be a XML broker. Since XenApp 6.5, where the controller-worker architecture is introduced, only a server with the controller role can be a XML broker. A server with the controller role is responsible for farm management. The Citrix XML service is most commonly used to provide users access to their applications and desktops via a web portal, leveraging the services of WebInterface, CloudGateway (Storefront) or Access Gateway. It is also used when users connect via the TCP/IP+HTTP protocol. It is recommended to have multiple servers with the Citrix XML server, as close as possible to the servers Zone Data Collectors (XenApp) and Desktop Delivery Controller (XenDesktop). The windows service is identified by the name CtxHttp, which reveals it leverages this protocol for network transportation. Basically the Citrix XML service has a built-in (simplified) webserver to transfer XML documents. The service is launched with the predefined local Network Service account, which allows it to communicate over the network. XML? XML stands for Extensible Markup Language, it is a markup language for documents containing structured information (wikipedia). 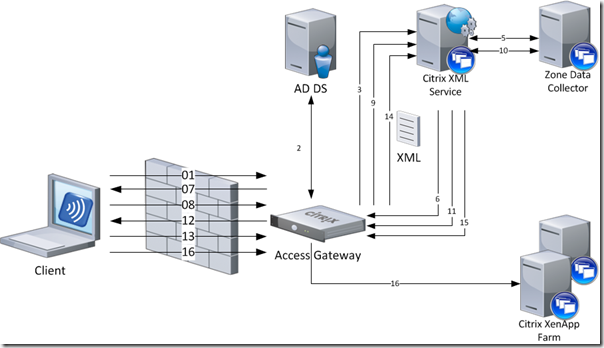 The Citrix XML service consists of a number of files to provide its services. The files are , by default, stored in %ProgramFiles%\Citrix\System32 on a 32-bit operating system and %ProgramFiles(x86)%\Citrix\System32 on a 64-bit operating system. By default the Citrix XML service listens on TCP port: 80. 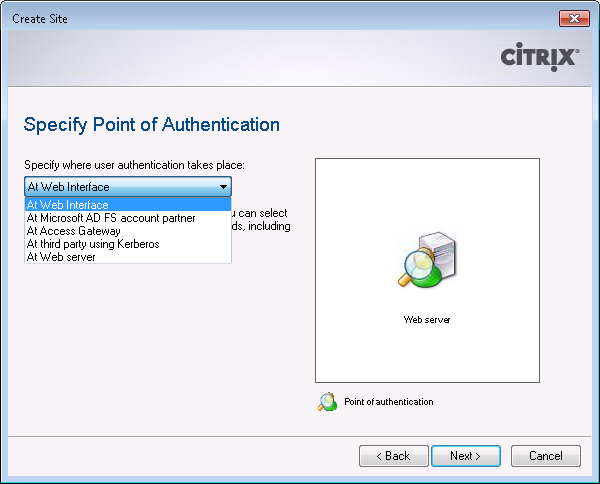 Although this is the default port, Citrix recommends using port 8080. 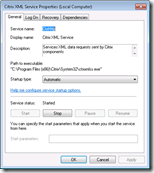 If Microsoft Internet Information Services (IIS) is installed the Citrix XML Service is integrated by default. Otherwise the Citrix XML service defaults to standalone mode. If during the installation the an IIS server (or the IIS server role) is detected, the files specified above folder are copied from %ProgramFiles(x86)%\Citrix\system32\ to %SystemRoot%\inetpub\scripts. 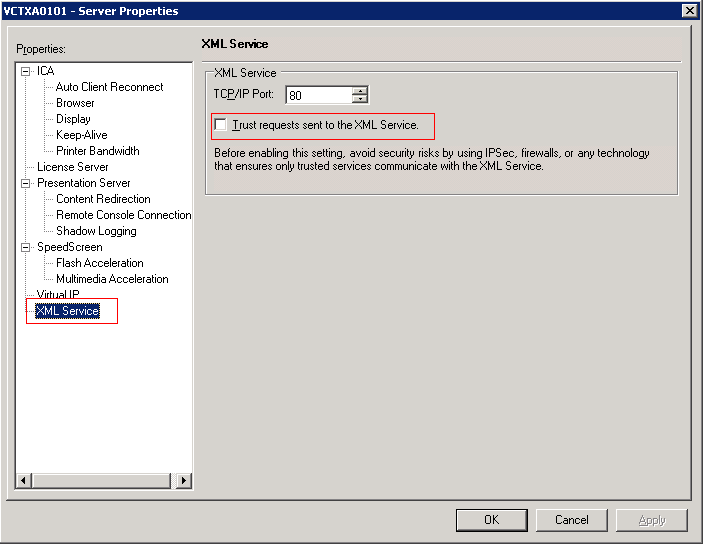 Letting the Citrix XML server integrate with IIS effectively (sharing ports) disables the use of the Windows Service and creates a Web Service in IIS. The page you are looking for cannot be displayed because an invalid method (HTTP verb) is being used. If a different process requires the same ports you will receive the message “Citrix XML port selected is in use by another application or service”. 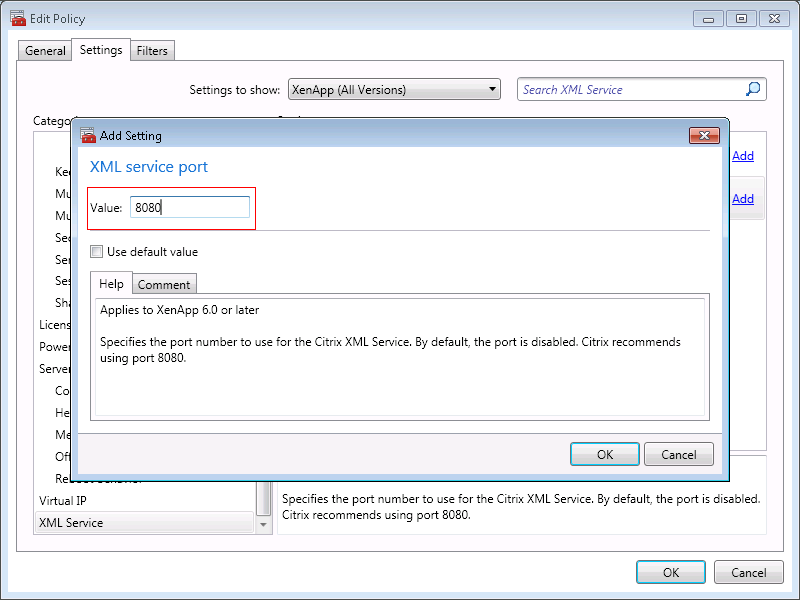 If necessary you can change the port of the Citrix XML server. The Citrix XML Service and Microsoft IIS can share a port (default = 80), you should only specify a different port if you don’t want to share ports. To find out what other process is using the same port you can run the following command: netstat –ano –p tcp (or netstat –ban –tcp if you have Windows 7 / 2008) and locate the process ID (PID) that listens on the same port. 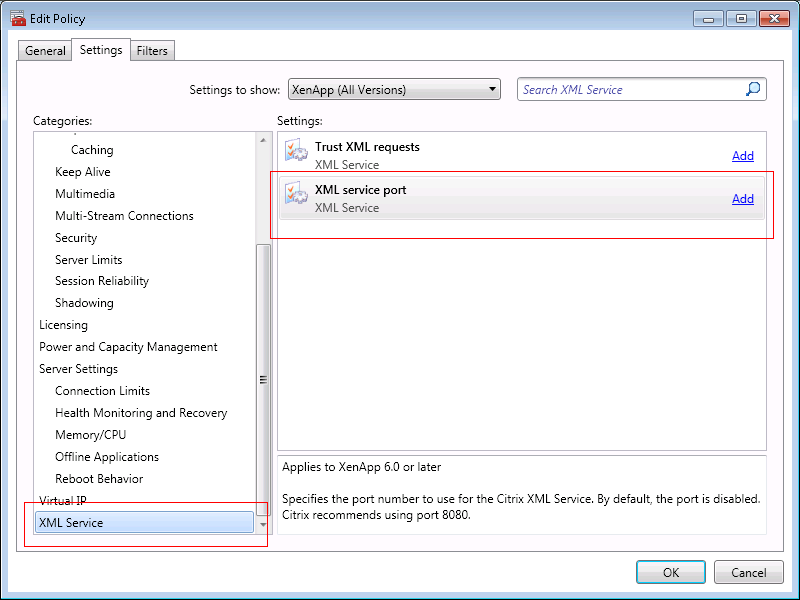 In XenApp 6.0 or later changing the XML port can be done with a server policy: XML Service\XML service port. However, this can only be done if you selected a custom port during installation instead of Share with IIS. The port number can also be changed with the ctxxmlss command-line utility. This can be done by unloading the Citrix XML Service with /u, changing the port with /r<port number> and restarting the XML service. 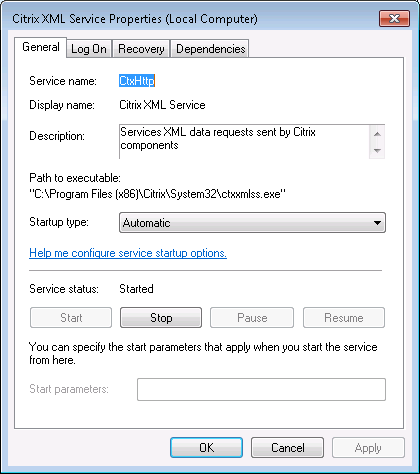 An alternative method is by changing the port in the registry (and restart the Citrix XML service after changing). The value is listed in hex, you need to change the view to decimal. 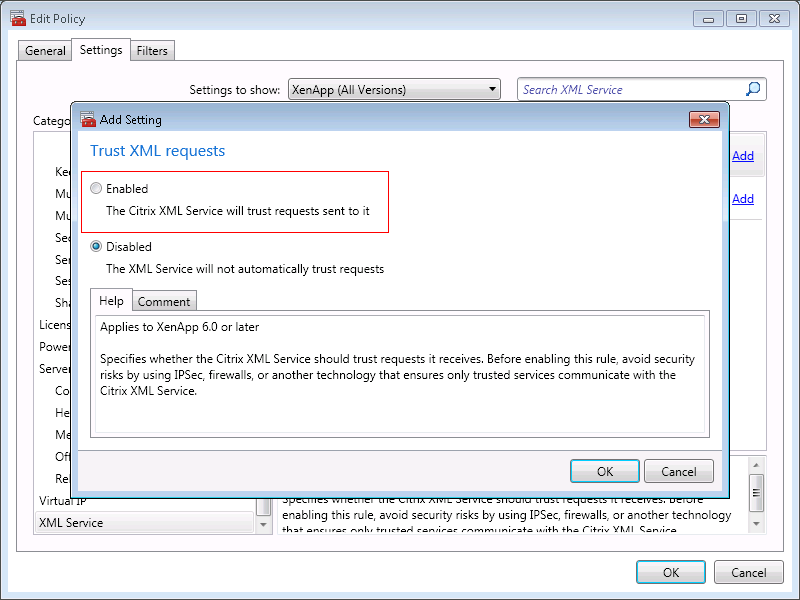 The security level of the Citrix XML service can be lowered by allowing the Citrix XML Service to trust all requests. The trust setting is only for Smooth Roaming when users authenticate using pass-through or smart-card authentication with WebInterface or online plug-in. To avoid security risks, only enable the Citrix XML service to trust requests it receives when you’re confident that only trusted services communicate with the Citrix XML Service. This can be achieved by using firewalls or using IPSec. By default the trust is disabled. 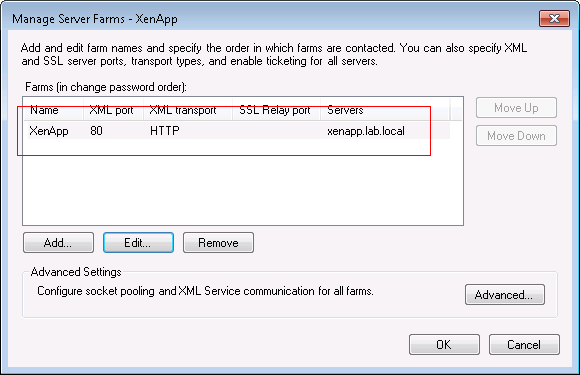 In XenApp 6.0 or later enabling the XML trust can be done with a server policy: XML Service\Trust XML requests. When a user starts his browser and connects to the URL of the web portal (WebInterface or Citrix Access Gateway), authenticates and launches an application (or desktop) a number of transactions take place between the WI/CAG and the XML Service. In a basic environment where the users connects to a published resource via a Citrix Access Gateway, the following transactions takes places. The webserver sends a default.ica file containing information about the resource, STA server (as configured in the secure access settings in the WebInterface) secure ticket and connection properties (more information about the ICA file can be found here). The CAG server accepts the connection and the connection is started. Nicholas Dille wrote an excellent article called ‘Talking to the XML Service’. If you want to dive deeper in the messages being sent by the Citrix XML Service, you should read it. The Web Interface and the XML Broker are complementary services. The Web Interface provides users with access to applications. The XML Broker determines which resources (like applications, desktops, etc.) appear in the Web Interface, based on the user’s permissions. The XML broker is used by the Web Interface to enumerate published resources from the a XenApp farm or XenDesktop site. This server also communicates directly with a Zone Data Collector (XenApp) or Desktop Delivery Controller (XenDesktop) to determine the system to route a user to when an application is launched through the Web Interface. 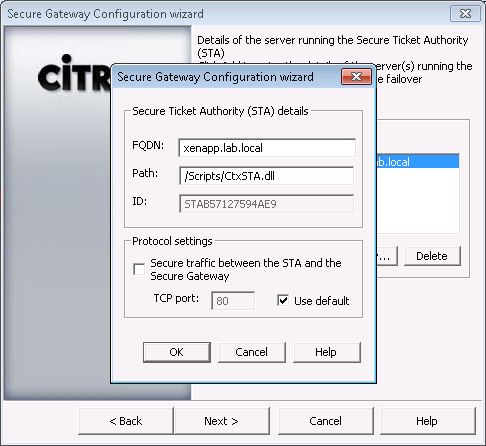 The Secure Ticket Authority (STA) is introduced with the Citrix Secure Gateway 1.0 (released around 2001). Before the release of Presentation Server 4.0 (released in 2004) the STA was a separately installed component that required Microsoft IIS to host the service. 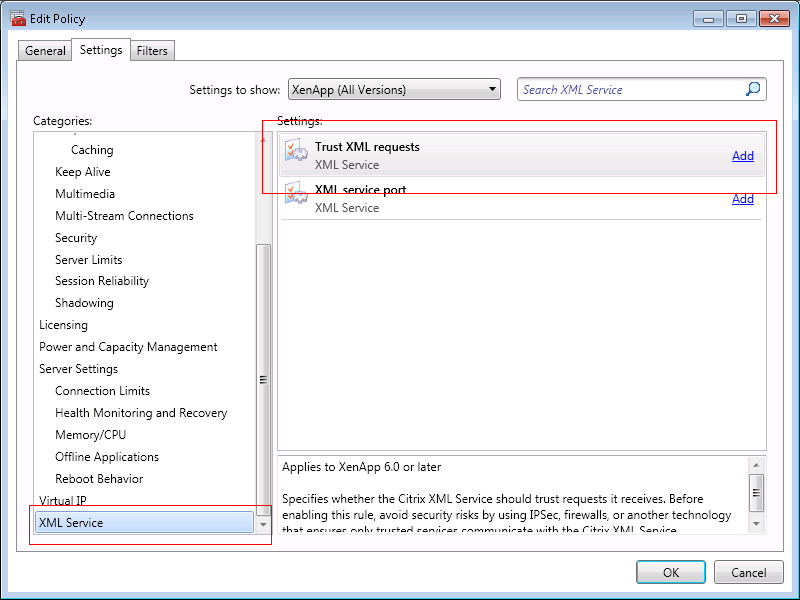 With Presentation Server 4.0 (and all future releases) it is part of the Citrix XML service. In this article I’m assuming your using PS4.0 or later and therefore the STA server is integrated in the XML server. The STA generates and validates secure tickets that authorize users to traverse a Secure Gateway or Access Gateway to a XenApp/XenDesktop farm. 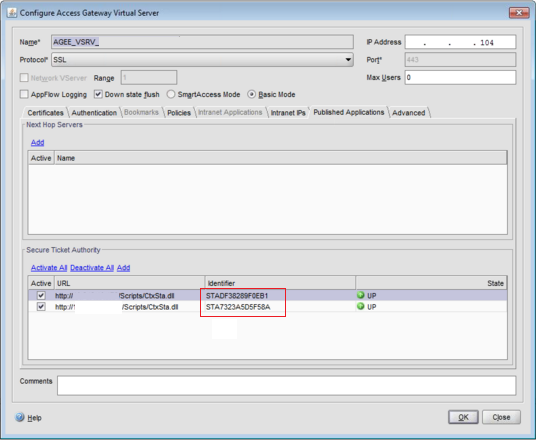 In a CSG deployment the gateway server does not perform authentication of incoming request. Instead the gateway defers authentication to an STA server to guarantee that each server is authenticated. If users have valid STA tickets, the gateway assumes that the passed the authentication checks and should be permitted access. The Secure Ticket Authority (STA) is accessed via /Scripts/CtxSta.dll. On the WebInterface you specify where the authentication takes place. This is the component that validates the credentials, token, etc. of the user to verify the user is who he says it is. It will then request a secure ticket from one STA for each farm (as specified in the Web Sites / Services Sites). The ticket and its corresponding data remains in memory at the STA for a configurable number of seconds (100 by default). The ticket can only be used once, so they are deleted after use. The STA ticket is stored in the Address property of the launch.ica that is provided by the WebInterface. For more information about the content of ICA file please read the article The Citrix ICA file explained and demystified. Whenever a secure session is initiated (the user launches an application or desktop) the traversed components (like CAG, CSG or MSAM) only has to validate the ticket at the STA. If the STA confirms the ticket is valid, access is granted. This is why it is important that all components (WebInterface, Storefront, Netscaler, Access Gateway, Secure Gateway, etc.) point to the same STA servers. Each Secure Ticket Authority is identified by an unique identifier that consists of a sequence of 0 – 16 characters representing the STA. This unique identifier is used in the ICA file (in the Address property) to direct the traversed components (like NetScaler, CAG, CSG, etc.) to the STA that issued the secure ticket. In version 1.x this string defaults to STA01, STA02 and so on. Since STA 2.x the STA ID is a hash of the server name (STAB57127594AE9 in the example screenshots above). If there is a mismatch or a duplicate identifier, the wrong STA is requested to validate the secure ticket (who hasn’t issued the ticket , and therefore stored in memory) resulting in an authentication failure. In time the STA is developed to support more features, as a result multiple versions of the STA exist. All versions of Web Interface (WI), Secure Gateway (CSG), MetaFrame Secure Access Manager (MSAM) and Access Gateway (CAG) are compatible with all versions of STA, but not all features are available. More information about STA compatibility with other Citrix products can be read in CTX108302. STA_VERSION: A numeric field that identifies the STA version . 10 stands for 1.0/1.1, 20 for 2.0, etc. TICKET: a randomly-generated sequence of 32 uppercase alphabetic or numeric characters. If you need to troubleshoot an issue with the STA I would recommend to enable logging first. Logging can be enabled in the CtxSta.config file which can be found in %ProgramFiles%\Citrix\System32 on a 32-bit operating system and %ProgramFiles(x86)%\Citrix\System32 on a 64-bit operating system. In this file you need to set LogLevel=3 and restart the Citrix XML service. By default the logfiles are stored in ..\Logs. 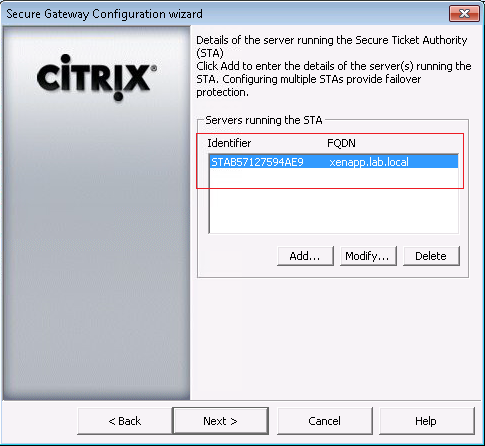 In the CtxSta.config you can also verify and change the unique identifier (UID) of the STA and change other settings. A common error is the ‘protocol driver error’ when you connect to a published resource via a Citrix Access Gateway (CAG). This error can be caused by a missing (or misconfigured) STA server in the Access Gateway. Each secure ticket authority (STA) server that is specified in the secure access settings of the WebInterface, needs to be configured in the CAG as well. If the STA is missing in the CAG it might not validate the secure ticket. This is because the ICA file contains the identifier of the STA server (in the Address field) and that needs to be validated by the CAG. If the identifier of the STA is not specified in the CAG, it doesn’t know what server issued the ticket and therefore can’t verify it. Have a question or suggestion? Let me know in the comments. Very good article, I like it. Awesome article, very clean explainiation. This really is the 3rd posting, of yours I personally checked out. It is really nice and Simple. Really good article ! Thanks. Thanks, I could fix my Citrix XML config problem after reading this. Indeed excellent article, there is a minor correction, the article mentions as %ProgramFiles%\Citrix\System32 on a 32-bit operating system and %ProgramFiles(x86)%\Citrix\System32 on a 64-bit operating system, which should be vice-versa. Also, appreciate if you add few more troubleshooting items, applications launching issue. The article is correct. The ctxsta.config is located in the 32 bit program files location. On Windows 64 bit operating systems, 32 bit code is installed in the “%ProgramFiles(x86)%” location and 64 bit code is installed in the “%ProgramFiles%” location. Windows 32 bit operating systems only have a “%ProgramFiles%” location.